Fate has much more in store for Tyler than he can ever imagine! 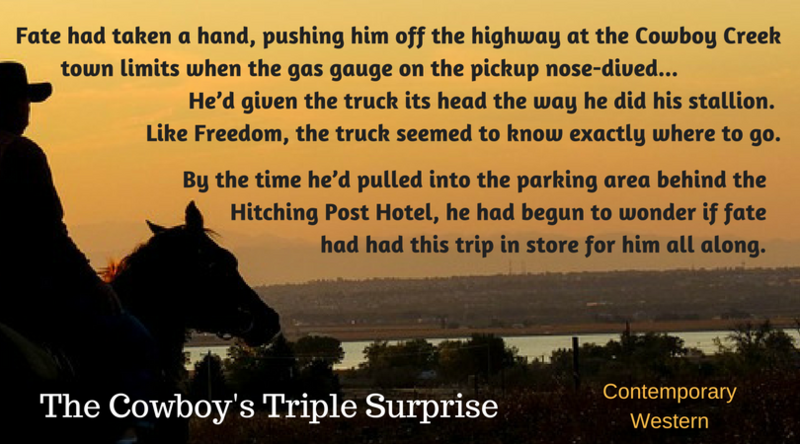 The last time rodeo cowboy Tyler Buckham was in Cowboy Creek, he spent a steamy night with local beauty Shay O’Neill. Back in town for a quick visit, he’s hoping they’ll have another go-around before he heads for his next rodeo. But seeing Shay pregnant—with triplets!—leaves Tyler feeling as if his best horse has kicked him in the gut. Stop by Book Heaven to read an excerpt with Tyler learning what fate really has in store for him. 😉 Here’s the link. Harlequin covers copyright Harlequin Enterprises Ltd. Cover art used by arrangement with Harlequin Enterprises Ltd.
All rights reserved ® and ™ are trademarks of Harlequin and/or its affiliated companies used under license. Site design by Karen McCullough.